So, now you have seen a cross section of what I have done with my life and talents. I hope it pleases your profile of what is good in the painted arts. 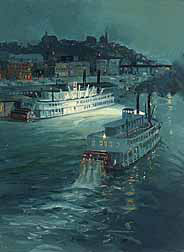 I have painted river ports, riverboats, deep water ports and ocean going vessels all my life. In the last few years I've been working on commissions from patrons who like how I handle a brush. I may have an insight that just may create an itch for the collector that only I can scratch. If I collected art I would want to work with an artist that had a defined passion to do a certain thing. I'd give him the money he needs, then stand back and watch him go that extra mile. Often, people pay me to paint what they want. This works to a certain level, but my finest works come from an idea that I am on fire to paint. If you'll take the time to read on I think that fire will warm your imagination and hopefully you will call me and then we can talk over in detail about why I have this particular fire to paint. When you really look at a painting, you can see through the minds eye of the painter. On the same level creative writers craft an image that frees your imagination and places you inside a literary art work so fresh that you feel the warmth of the sun or smell the breeze blowing over the river. The art collector, the reader and the historian spend lifetimes looking for the treasures scattered among the weeds of the ages. Such an American treasure was Captain Frederick Way Jr. He was a unique American riverboat captain, writer and historian. I have excerpted for you just in one paragraph he wrote about a steamboat named the QUEEN CITY. She ran the Ohio river during the first third of the 20th Century. I would like you to read this and stay with me while I tie the threads into a fine rope for you. "Your scribe fell for the wiles of the QUEEN CITY in 1911 standing in the forward end of the cabin gazing aft at her multitude of repititions; repitition of doors, of shining brass oil lamps in their swinging brackets, of overhead lights coming from twined oak leaves of metal, of chairs soldiered in parade, and her dining tables the same way - all of these things as trim as West Point cadets, sweeping in a dip downward to the mid-ship gangways, then up again to the immense mirror in the distance - an unbelievable distance - twice as wonderful as anything military; a person could wear out his eyes looking for a single straight line; there wasn't one anywhere; all was cadence and curve, an immense arc. A lady at the grand piano played. She sang in a dusky voice "Oh Beautiful Lady" and "Chocolate Soldier." She had too much powder and paint for my mother's standards, but I thought she was a blessed angel, and shall expect all honest angels to resemble her in the Hereafter. I was 10 years old when this indelible tattoo creased my imagination. The QUEEN CITY did this to adults as well, so I learned later". There are literary pearls among his books that exhibit the wisdom of a man who stood the deck then had the intellectual depth to record these experiences in his own words for us. He left us an image of America that has passed to the ages. I knew Cap Way at the end of his life. By then he was bent over and small. His hands were twisted from arthritis. We talked of the usual things but he looked at me once, over his little reader glasses, his eyes kind of lit up and said to me quite out of context that I had a "part to play down the road". Now I think I understand what he had in mind and here is where the three threads come together to make a fine rope. I want to paint what Captain Way described in his books LOG OF THE BETSY ANN and PILOTIN' COMES NATURAL and other works. These are not to be mere illustrations. They are like a marker, a key to yesterday's America and a reminder of a way of life that has vanished forever. In the night scene LOOKING FOR A SINGLE STRAIGHT LINE, Captain Way's BETSY ANN shines her spotlight on the QUEEN CITY. Oil Study for LOOKING FOR A SINGLE STRAIGHT LINE. So now you begin to see a Da Vinci code that belongs to the river. When the painting is finished, framed and hung for the viewers to see, someone will look at it and read the title plaque and won't understand. That's when we become teachers. Another is the old Pittsburgh landing with the Smithfield Bridge in the background. The boats are the QUEEN CITY, SENATOR CORDILL, and GENERAL WOOD. The BETSY ANN is to the heading out for Cincinnati. It is a simple but long and fascinating list for one who "sees" from the written word. The images on this commentary page are miniature oils. They are the first night out on a journey to a finished oil painting. They have a fresh clean thought about color and design. They are like notes scribbled on the writers pad and I have many more waiting for my attention. If you have had the patience to read along this far, then I think I have a good idea just who you are and will be pleased to have a conversation with you over the phone. Anyone interested is welcome to stop by my house, but I live in an out of the way place along the upper Mississippi River. Some say my work is too expensive. Others say I don't charge enough. I believe there is more value in what I do than I bill for. I do frame my work in Munn and Thanhardt Burger gold leaf hand carved frames pretty much as you've seen them here. I have never bothered with or made the effort to do a museum art show. Either I am too slow or have too great a demand for what I do. The truth lies on both sides of the issue. Looking back on what I have done with my life, I guess I could come up with a resume to impress you if that's what you need. If Captain Way were here to answer this question for me, he would probably say most of them "were hanging in the parlor, a few in the hallway but none in the cellar of the art world". I paint about four or five big originals every year and several little pieces if I have the time. I've told you what I want to do and it's just burning a hole in my apron. I probably spend too much time away from my family. I hear my children's footsteps in the hall more than I see them. This is not a plea for your sympathy. It is how I live my life and like Captain Way promised me those many years past "I have a great part to play". Give me a call, if things are agreeable I'll send you some of my stuff and we'll see where things go.